Navigating the ins and outs of a new group’s social dynamic is often awkward, vulnerable, and scary. 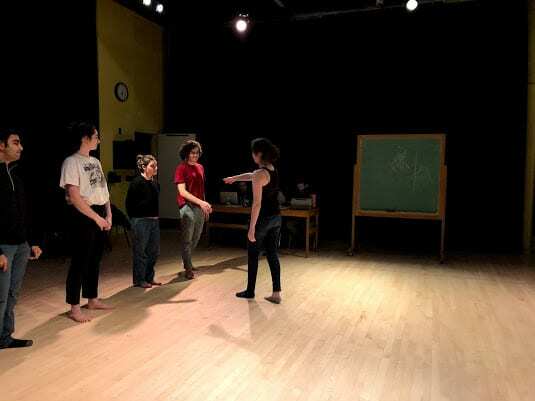 Circle Mirror Transformation explores the progression of becoming comfortable with a new group of people in a Vermont acting classing located in a public gym. Over the course of 6 weeks, 5 people spanning from complete strangers to a married couple take on this challenge in what becomes a sobering, heartfelt and at other times heart-wrenching examination of what it is to be human. 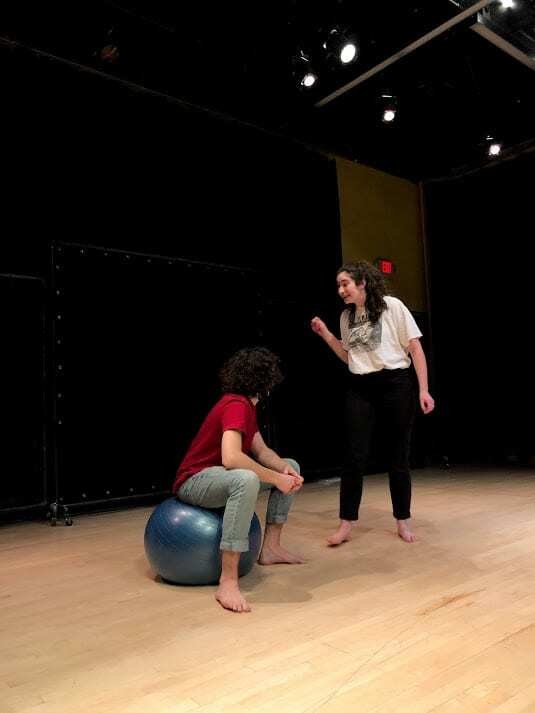 Below actresses Ruby Daniel (Whitman 2020), Lucy Evans-Rippy (Whitman 2022), and director Anthony Reale (Whitman 2019) grapple with taking on this production that relies highly on social dynamics and relationship nuance. What has the process been like directing and acting as characters that are, well, aspiring actors in an acting class and what advantages or challenges has this posed? LE-R: It’s been fascinating to inhabit a character that is, for the most part, someone that I fear becoming/being. Theresa’s unsuccessful acting career and unsureness about what her true purpose is as an actor, is something that I find myself obsessing over often. RD: There are so many layers. It is awesome in a lot of ways, and also really difficult to act as a character, and in my case the teacher of, an acting class. I think nearer the beginning of the process I struggled to find who my character was as a person, as a teacher, and have legitimate and honest reactions within the class setting, without it feeling forced. I am still figuring out how it all fits together. 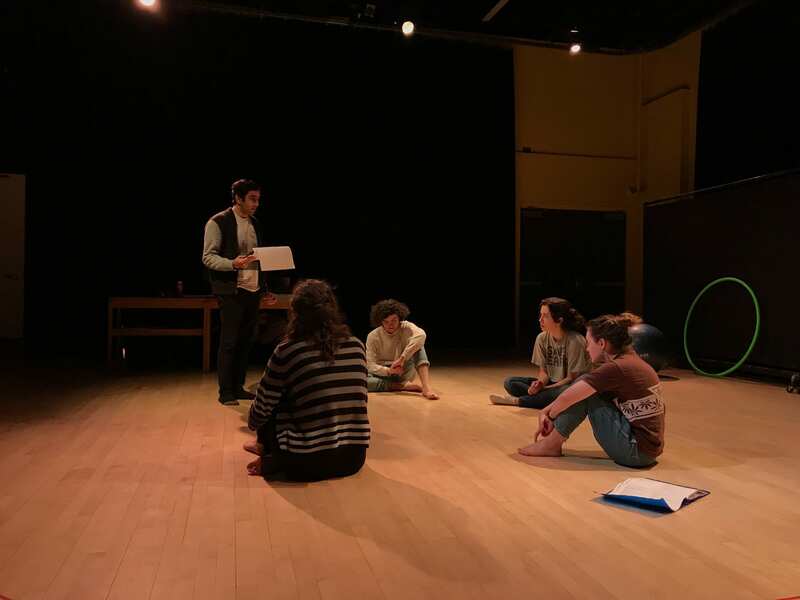 But what’s so exciting about the form is that we get to react in real time to very intense moments within the acting class, and so much has to be communicated through exercises and games and acting work. It’s a new way to look at how relationships translate. How might an audience member who knows very little about the “acting classroom” find this play valuable? AR: Annie Baker has discussed how she writes plays situated in the places not commonly seen. Circle Mirror Transformation follows this thread, by showing the audience a place that they probably have never seen. Some of the characters themselves are unfamiliar with the basement room in which this play takes place. When deciding on plays to direct for my thesis, I especially resonated with CMT because of the fact that this is not a play with obscure theatre or actor references. The audience member with absolutely zero experience with the theatre world need not worry! This play is beautiful for anyone, regardless of acting literacy. LE-R: For anyone who has never acted, taken an acting class, or even played a theatre game, i think they will have extremely unique experience watching this show. They’ll have the opportunity to learn alongside a lot of the characters and follow that part of their journey through a unique, personal lens. Is Circle Mirror Transformation a comedy, tragedy, or both and how does this melding of genres or lack thereof feed into the themes of this play? RD: I think this play gets to be funny and heartbreaking in equal measure. The subject matter is really heavy at times, but the vehicle that most of it is delivered on is not incredibly serious. It’s been fascinating to play with stakes and importance in a play that moves through genres as each one serves its purpose. I don’t think you can call it either comedy or tragedy for that reason. Why put on a show about relationships and connection in 2019–a time where instant access to relationships and social connection through cell phones and social media is particularly available? AR: Human connection supersedes digital connection in this play. We see characters learn, begin to love, betray others, and grow immensely while their phones lie dormant in their bags. I think we (as humans) have learned–both through our technological advancements and our love of the instant and the convenient–to prefer quick interactions rather than ones that will be fruitful in other ways. Baker points to how life in the slow lane results in deeper human emotion. Even in the ‘failed’ relationships in the show, one can see the learning that each of the characters does within that interaction. This show expresses a love for and makes a case for the human connection we all have a chance to make if we put down our phones for awhile. LE-R: Due to the fact that social connection relies rather heavily on social media, a play like this is more relevant than ever. It gives the audience a chance to step back and watch genuine connection build and move through the awkwardness of real, human connection. Who or what transforms in Circle Mirror Transformation? AR: No character is the same after the course of CMT. Annie Baker writes a play that, from the surface, looks dormant; in reality, her quiet and pointed style results in a volatile narrative in which characters both come to terms with situations they don’t like and grow despite the thorns that tear at their clothing. I think that’s the point of CMT. Baker demonstrates that this basement room could be anywhere, and this type of narrative could happen to anyone. In this play, we can see a little bit of ourselves in the characters if we look closely enough. Not only do these characters transform, but I think they show us that we all possess the same capability for transformation. In this play, I don’t think it’s too far of a leap to argue that the audience looks directly back at themselves through this kaleidoscopic narrative. And that’s why I love Circle Mirror Transformation! It portrays a humanity that isn’t afraid to take a leap of faith and make mistakes. LE-R: Each character changes, transforms, and grows. Not only do they transform as individuals, their entire lives are altered due to their choices, feelings, or perspectives and causing a shift within not only themselves but each other. Have any moments in the rehearsal process surprised you? LE-R: It has been a phenomenal experience getting to discover different things throughout our rehearsal process. Due to the way the script is written, there are so many small details that are scattered throughout different scenes. I’ve loved the moments when one of us puts something together and is like OH I GET IT!!! It’s such a unique experience to share with a group of people. 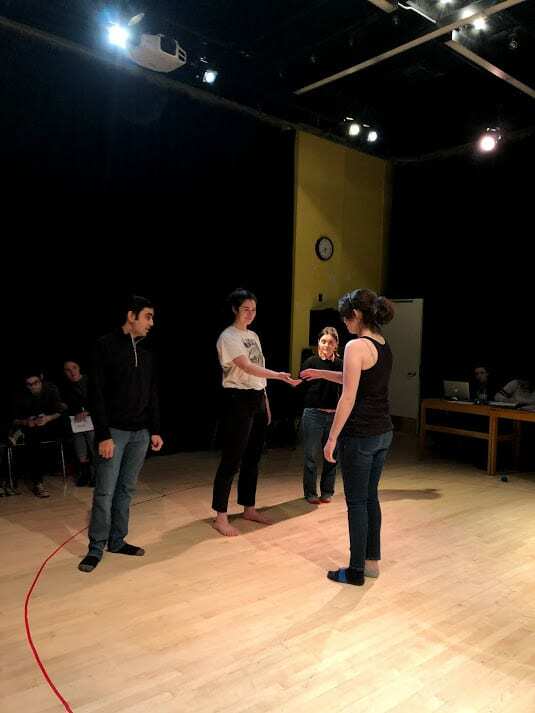 Circle Mirror Transformation runs Thursday, February 28th – Saturday, March 2nd @ 8PM & Sunday, March 3rd @ 2PM. Get your tickets online here or at the HJT Box Office M – F 12 – 4PM on Whitman College Campus. See you there!